We are getting RAVE Reviews from our new VR rentals & can help you pick the perfect experience for your event! Details: We deliver & can fully concierge the virtual reality rental or drop it off. We even have awesome deals if you pickup from our warehouse in Leader. The Experience: We love the Playroom VR which has a bunch of mini VR party games that is ideal for parties with lots of guests that want to rotate in and experience VR. Don't worry we provide all the controllers & the full system. We can even take care of all the details & concierge your event with our VR experts or we can train you to easily run it for your party. WOW! You’ll get to chase your friends as a giant dinosaur, walk around the office in a real cool workplace experience, & even descend in a shark cage that gets in a clost encounter with great whites. Some of the games are cooperative and others are competitive, offering a great mix of teamwork and versus play. 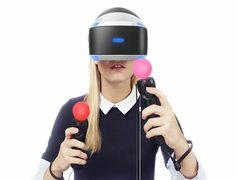 The Playstation VR is a no-brainer for VR party.